More money will come from St. Louis’ parking division to help shore up the city’s reserve fund. In a compromise forged this week, St. Louis Alderman Jeffrey Boyd, D-22nd Ward, and Treasurer Tishaura Jones agreed that $10 million will be taken from parking revenues and put into the city’s reserve fund. The move came after months of contentious debate between Boyd, the chairman of the Streets, Traffic and Refuse committee, and the treasurer. Earlier this week Boyd had presented a budget proposal requesting $6 million from the treasurer’s office and cuts to her staff. Under the compromise, approved by the committee 7-0 on Thursday, Jones will lose no staff. “This agreement with the City accomplishes two things,” Jones said in a statement. “It protects my staff from petty political attacks, and it also helps the City shore up its reserve funds in order to improve its long-term fiscal health." Boyd did leave the door open to possible layoffs in the future, saying difficult economic conditions could mean fewer employees for the treasurer’s office. The city has long attempted to get its hands on more of the revenue from the parking division, which under state law is part of the treasurer’s office. But those state laws also limit the amount of money the parking division is obligated to send the city. Last January, a former city attorney sued, challenging the constitutionality of the state laws — a position Mayor Lyda Krewson supported despite being named as a defendant in the case. Circuit Judge Michael Stelzer ruled April 5 that the laws in question “violate Article VI, § 22 of the Missouri Constitution by creating or fixing the duties or powers of municipal offices of the City, namely the Comptroller, the Chairperson of the Aldermanic Traffic Committee, and the Director of Streets.” Those three are members of the parking commission, which oversees the city’s garages and meters. Aldermen earlier this year passed legislation to keep the parking operations going, but also to boost the amount of money the city could receive. The sponsor of that measure, Boyd, is a longtime political rival of Jones. 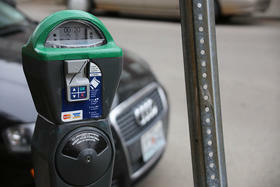 Boyd and Jones have debated over what entity controls the parking division for months. Jones argues that her department is abiding by the city’s policy to transfer 40 percent of their funds from city parking meters and garages to the city’s general fund. The bill approved Thursday is a one time addition of money that does not affect how much revenue goes to the city’s budget every year. The deal also will include $800,000 for the city's neighborhood stabilization officers and $250,000 for two tow trucks for the parking division. Rachel Lippmann contributed to this story.